Welcome to my Island Dream Life. A cozy setting, nestled in the lush tropical vegetation which includes the symbolic palm trees that thrive in the rich volcanic mountain soil of these Islands. Here is a view you will never grow tired of. 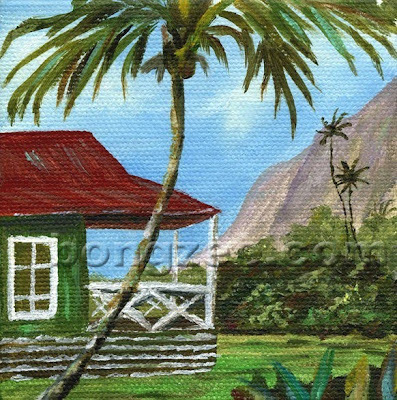 Although they are becoming rare, you can still come across these charming little Plantation Style Cottages in Hawaii. MAHALO for taking the time to view my artwork!